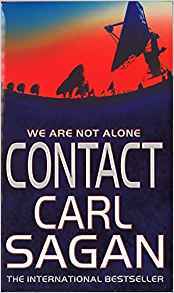 [Currently reading] Contact, by Carl Sagan. Not expecting to gain anything...I just love scifi books. At first it seemed impossible - a radio signal that came not from Earth but from far beyond the nearest stars. But then the signal was translated, and what had been impossible became terrifying. For the signal contains the information to build a Machine that can travel to the stars. A Machine that can take a human to meet those that sent the message.They are eager to meet us: they have been watching and waiting for a long time.And now they will judge.